My dad (Eddie Davis) was the eldest of two sons born to Mary Jane Lewis & James (Jimmy) Davis, on the 4th November 1913. I believe My dads mum, was one of thirteen children, & his dad Jimmy was one of twelve. Eddies younger & only brother Tom Davis, was on the committee of the Constitutional Club, Heath Hayes, for many years, & had worked for Chaseside Plastering (Stafford St.), & for Clarke’s furniture shop in Cannock. Eddie & Tom spent a lot of their childhood time in Rugeley, because their mom was from a big family by the name of Lewis in Rugeley. My dad eventually got awarded a place at Grammar School, but unfortunately, his parents could not afford the financial support required to send him. However, at sometime just prior to being taken on by the Coop, I remember my dad telling me, he had just one day down the pit, with a few members of his family. He told the story, that when the shift finished, and the cage had got to the surface, one of Eddie’s uncles gave Eddie a kick up the backside and said to Eddie, “Yoh con do better than werk down this bloody black ole young man, and if yoh dare ter come back agen termorra, yole get another kick up the a***”…………….he said he never went back! In his formative years, he played football, and was also a member of the Heath Hayes Brotherhood. He also belonged to a Boxing club that was held in St. Johns Church Hall – whether this came under the wing of the Brotherhood, I don’t know. My dad told me many times, that one night, whilst he was in the boxing ring doing a bit of sparring etc., a group of people came into the boxing club that he didn’t recognise. One of the group was particularly interested in the boxing, & stood watching for a while. My dad must have said “Are yer interested in boxing”?, to which the guy replied, “Arr, I am a bit”. As the story goes, another few minutes went by, and my dad said, “If yove got time, come and have a go, I won’t hurt ya”. With no more ado, the guy donned some gloves, got into the ring, and my dad got the biggest thraping of his life. When my dad had conceded defeat, the guy told him that the group of people that had come to visit, were from a police sports club, and that he himself was the Midlands Police Heavyweight champion. He also told my dad to be wary of whom he asked again. The only time my dad and I ever fought, was at one of his latter youth clubs, whereby if we got to the youth club early, we’d put the gloves on and do a bit of a sparring/boxing before anyone arrived, and occasionally when the club was in progress. My dad then joined, the then, Cannock Coop Society in 1927, before it merged with Walsall & District Coop. He married Grace Norris, in August 1936, (daughter of Fred & Harriet Norris), while working for the Coop. 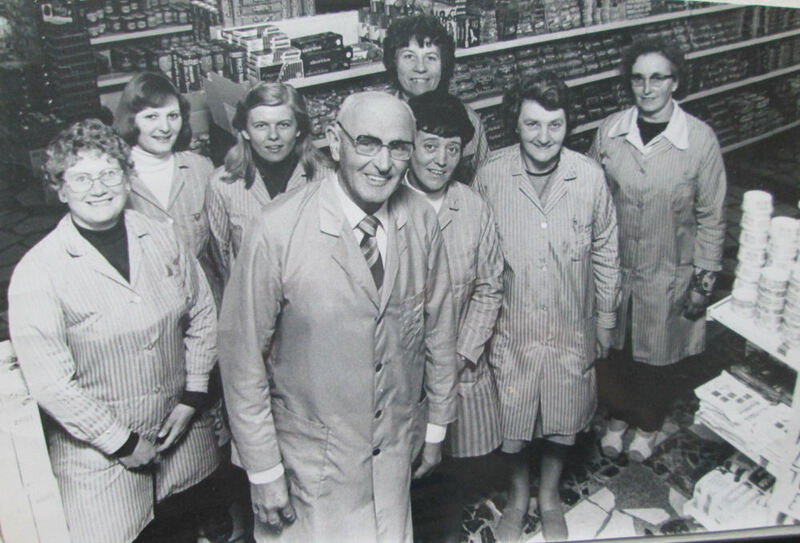 He worked his way up, & by 1949, he was a manager, & worked at Ogley Hay, Boney Hay, Chase Terrace & Bridgetown Coop shops, before moving to Heath Hayes in 1957. A few years after moving to the Heath Hayes Coop, the old Coop was demolished, and the new ‘Supermarket’ was built. I also believe he was seconded to mentor staff at the oddly named Coop ‘Krazy Kuts’ store, in Cannock for a while, this being at the same time as he was manager at the Heath Hayes store. 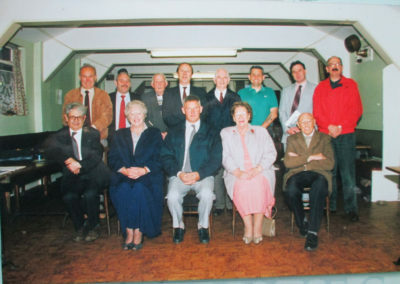 One night, Mr Howard started to approach the entrance to the Coop at Ogley Hay, when my dad spotted him, and said to one of the members of staff, “Hey up Alice, ‘Tickers’ just got out of his car to come and check that we ain’t locked up yet”. Now Alice was oblivious to the fact that Mr Howard’s nickname was ‘Ticker’, and on Mr Howard entering the store, pleasantries were exchanged, and all was well until Alice said “Good evening Mr Ticker”. My dad always said he could have crawled under the shop counter, but got out of it someway – I can’t remember how. My dad worked for the Coop for 51 years, and at Heath Hayes shop from 1957 until his retirement in 1978. He was champion of two very early Heath Hayes football teams (along with his brother in law Jack Melloy & Royden Cartwright). 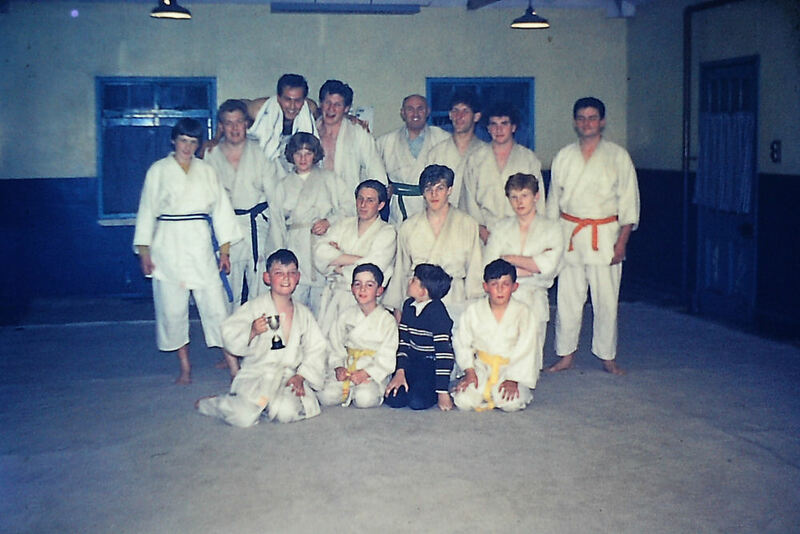 My dad was then leader of a Coop youth club, a Coop Judo club, taught people to swim on Sunday mornings, along with running his own Regent Dance Band. With regards to the Sunday morning swimming lessons, a hugely successful swimmer who eminated from these Sunday mornings, was Lois Lakin, who still lives on the village of Heath Hayes. Another humorous story my dad used to relate, was with the dance band. 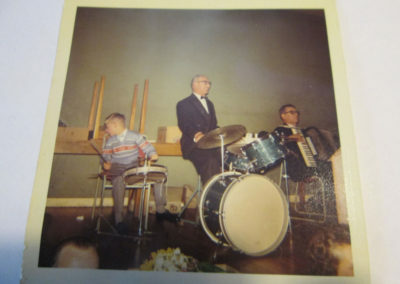 He had played for the Walsall Coop’s annual Christmas dinner dance many times at the Kenmare restaurant, at the old Coop store in Bridge St., Walsall. On the night of one particular Coop Christmas dinner dance, the roads were very very icy. Unfortunately, on their way home from the Coop dinner dance in Walsall, my dad’s old Wolseley car, (the type with running boards), slid off the road on black ice, into a telegraph pole, half way between Pelsall finger post and the Turf pub. The car hit the telegraph pole with sufficient force as to crank the pole over at a slight angle, but also to hurl the double bass off the car’s roof rack, just over the hedge into the field. 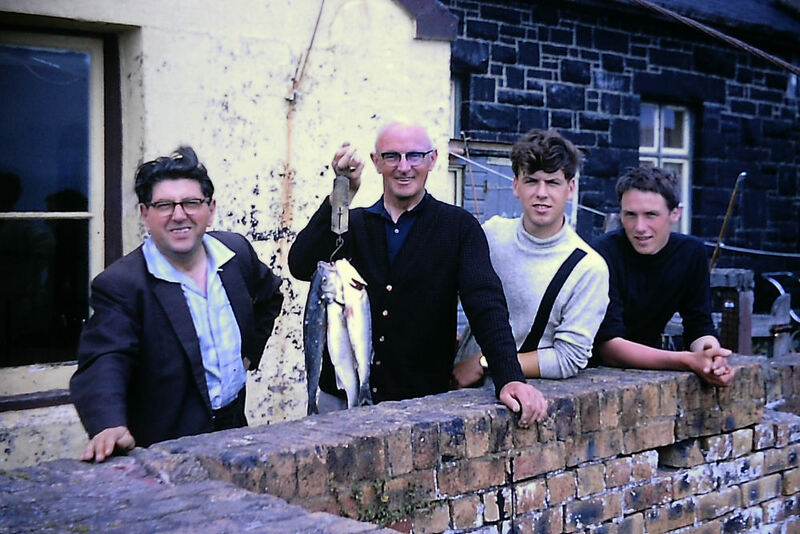 With the old car bumpers being spring loaded, the car sustained little damage, so the band retrieved the double bass, pushed the car back on the road, and got home. However, it was customary for one of the Coop bosses to phone my dad the morning after the annual Coop Christmas dinner dance, and thank my dad for another really good night. But, no phone call was received by my dad until very late in the afternoon. The boss that rang my dad, started the conversation by saying, “I’m sorry I’m later than usual in ringing to express our thanks for yet another great night Eddie, but some silly bugger hit a telegraph pole last night, between Walsall and Heath Hayes, and brought the phone lines down, and they’ve only just finished repairing them”. My dad started laughing saying, “I know – it was me”. I heard that story a few times. To relax, my dad had many days fishing at Barmouth, sometimes off Barmouth Bridge, sometimes off Jim Colley’s self built boat. Jim (originally from Poland), ran a very successful carpentry business a few doors away from us in Stafford St.. Jim later moved to live on the A5 Watling Street, and Jim’s business grew, along with his family, later becoming Colley Construction. On my dad’s retirement in 1978, my dad started part time weekend work at Tyler Mall Home Furnishings Store in Wimblebury, and later Brian James Furniture store in Cannock, Brian James actually being started by a group of people who worked at Tyler Mall. Due to my dad’s popularity/notoriety in the local area, he outsold most of the full time staff at Tyler Mall, on his part time hours. I have to word this next paragraph very carefully, because for a few years, my dad then became one of Santa Claus’s many helpers prior to Christmas, by dishing out Christmas presents, in a Father Christmas costume at Five Ways School, Langholm Drive. My own children Peter & Victoria, were both at the school at the time, & Peter came home the one year & said, “Father Christmas had got a gold ring on his finger, just like Grandads !” This time it was me who had to find the right thing to say. 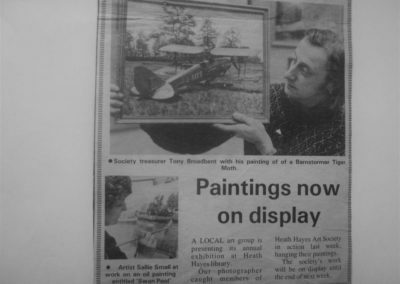 My dad then jointly started the Heath Hayes Arts Society, which I believe is still going strong today. 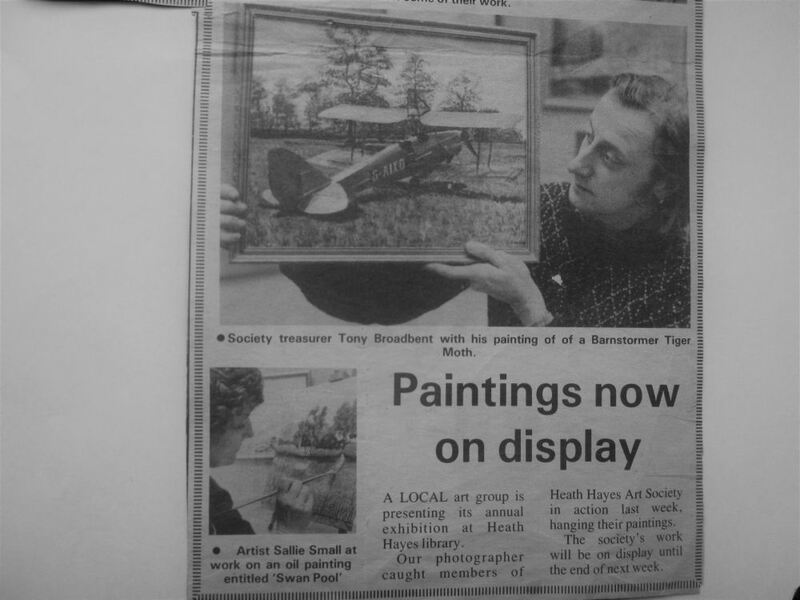 Then after putting his paint brushes to one side, my dad became an active member of the Heath Hayes and Wimblebury Parish Council. He died on 31st August 1999, at the age of 85. As Melvyn Davis, Eddie’s only child, I have lived on the village of Heath Hayes all my life, and still do, in Highfield Road. I was born on the village (at a very early age), at number 58 Stafford St., which is now Needwood House Nursing Home. I have done my best to portray, just how much I believe my dad did for the youth of the village, in the following photo’s & words. I don’t know all of the people on the photo’s, so if anyone can help, please contact me via email at, [email protected] . All my life, my dad and I had been inseparable, and I miss him dreadfully. I have to say I’ve shed a few tears whilst I have been composing this, what I believe to be, a merited recognition of his selfless work. 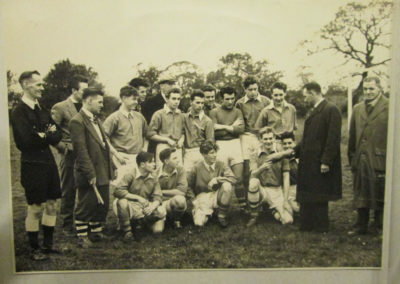 Names of heath hayes early closers are: back row l to r: Jack Smith, Cyril Reeves, G. Kelly, J. Evans, Sid Murcott, A. Wallbank, Gardner. 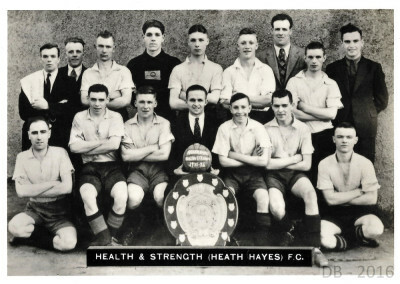 Another team on the village of heath hayes ‘bank street rovers’ dated 1947. Centre front row might be a trevor mansell. But unfortunately, I don’t know any of them for sure, but someone may. 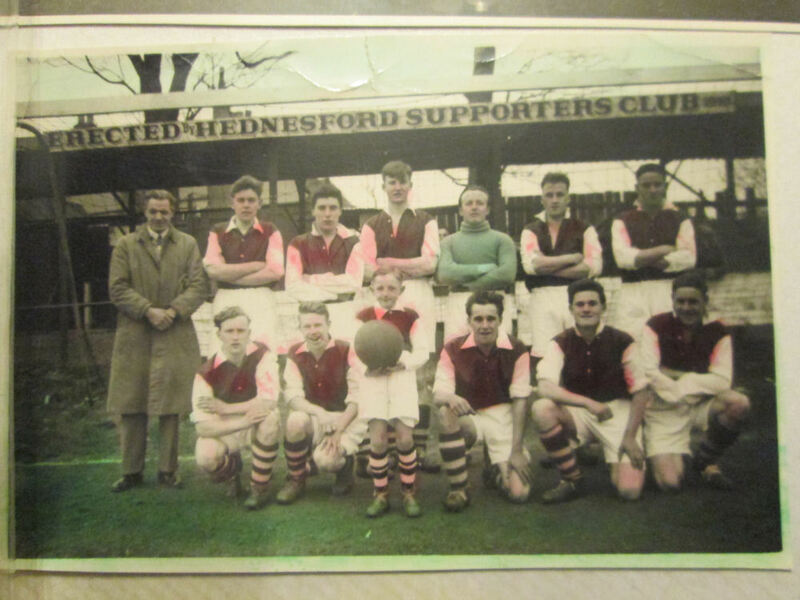 Eddie’s 1st football team, before a cup final at hednesford’s old ground, behind x keys. Jack Melloy, unknown, unknown, Billy Barrett ?, unknown, unknown, Mick Doody. 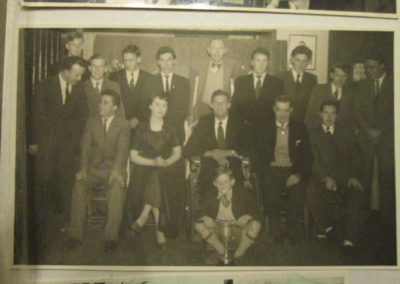 Front row left to right:- Jack Roper, unknown, Melvyn Davis (mascot), unknown, unknown, unknown. 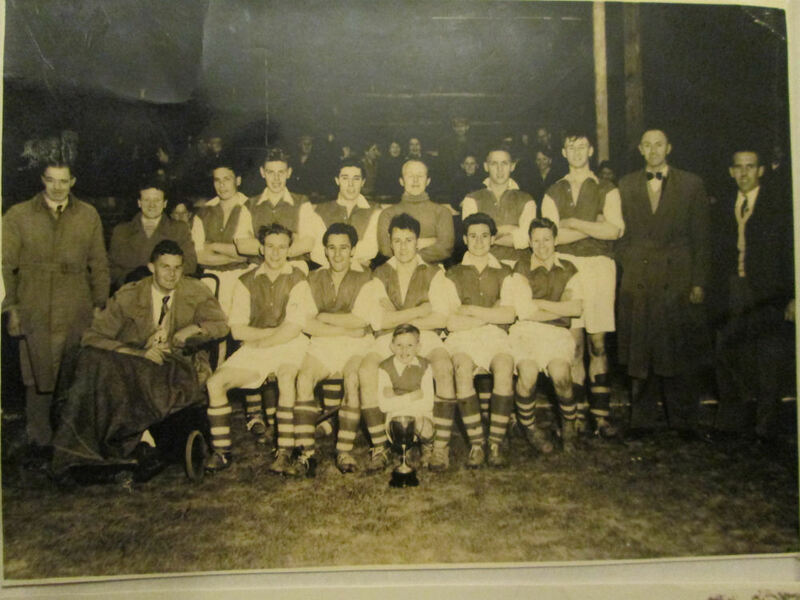 Eddie’s 1st football team, after same cup final at hednesford’s old ground behind x keys. For years after, eddie talked of Mick Doody’s 30 yard goal, that the goalie never saw until the ball was in the net, stating he’s not sure there’s been a goal like it since, on hednesford’s ground. 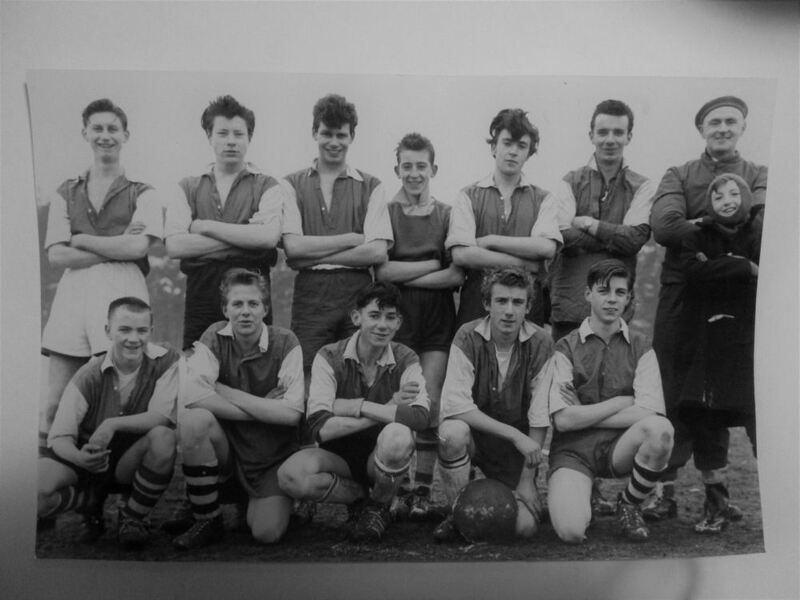 Jack Melloy, Eddie Lockley, unknown, unknown, unknown, unknown, Mick Doody, Billy Barrett ?, Eddie, Alec ???. 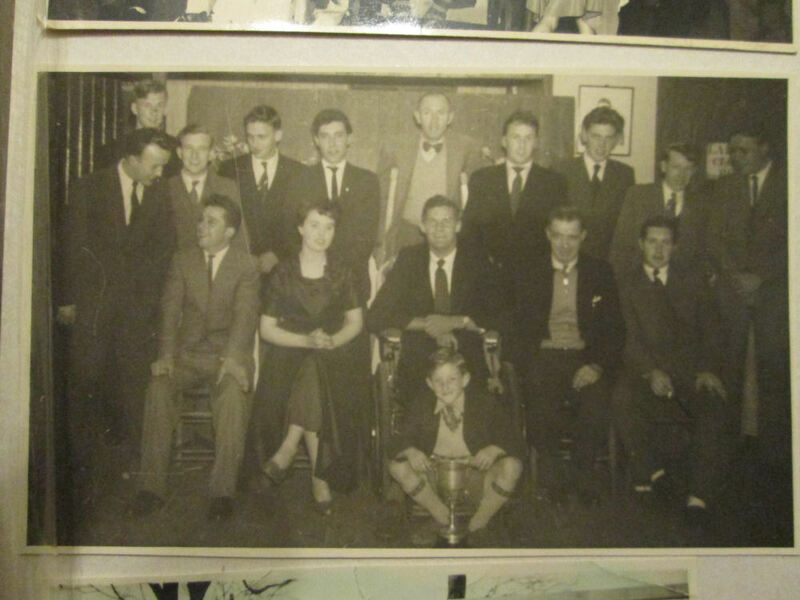 Photo of eddie’s 1st football team, and guests, at the heath hayes may/blossom queen? 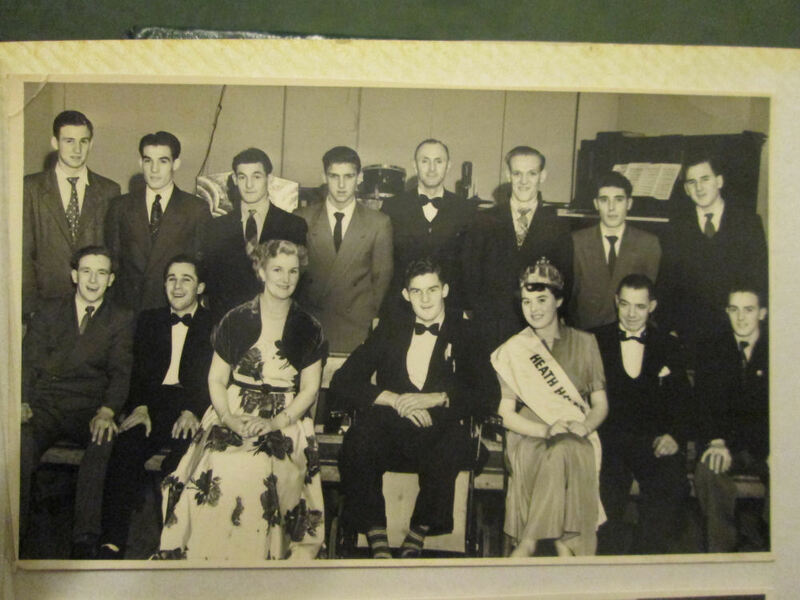 Annual event, possibly st johns church hall, around 1954 ish. 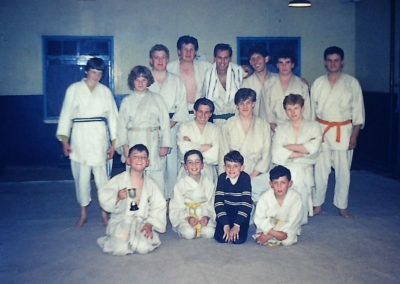 Billy Barrett ?, unknown, unknown, Mick Doody, Eddie, unknown, unknown unknown. Again another football function, maybe even may/blossom queen again. 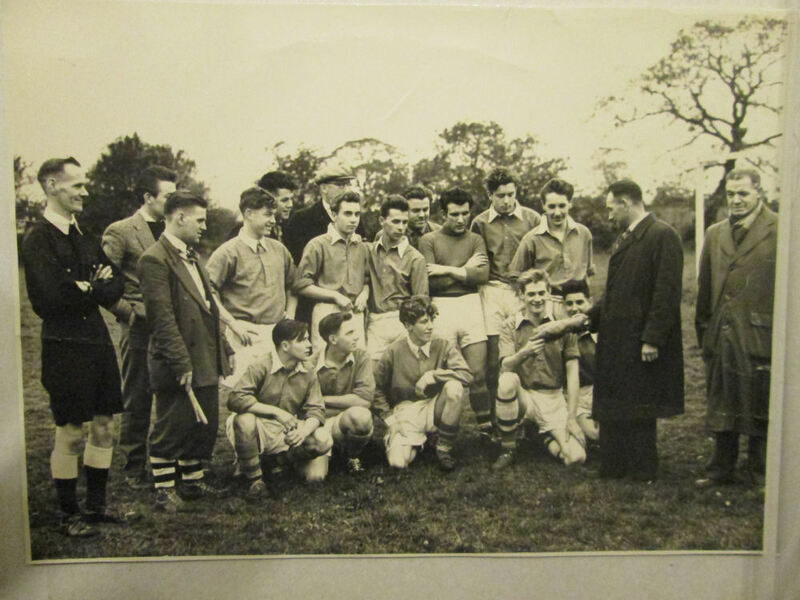 I’m fairly sure this is 1955, when the football team had won the cup at the x keys. However, the team were one man short for the last match of the season played on the pitch in the old leacroft lane. I remember my mum had a dream the night before the match, about eddie breaking his leg in this match, and begged him not to play at the age of 42. However, he took no notice, & lo and behold, broke his leg for the third time in his football career – you note he’s on crutches. He was also in the dog house for the full 16 weeks recovery! As long as I can remember, I believe my dad’s vocation in life was to be a mentor for youngsters. 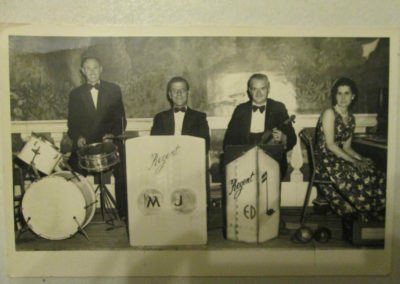 This photo shows eddies band playing at an annual function at burntwood memorial hall. 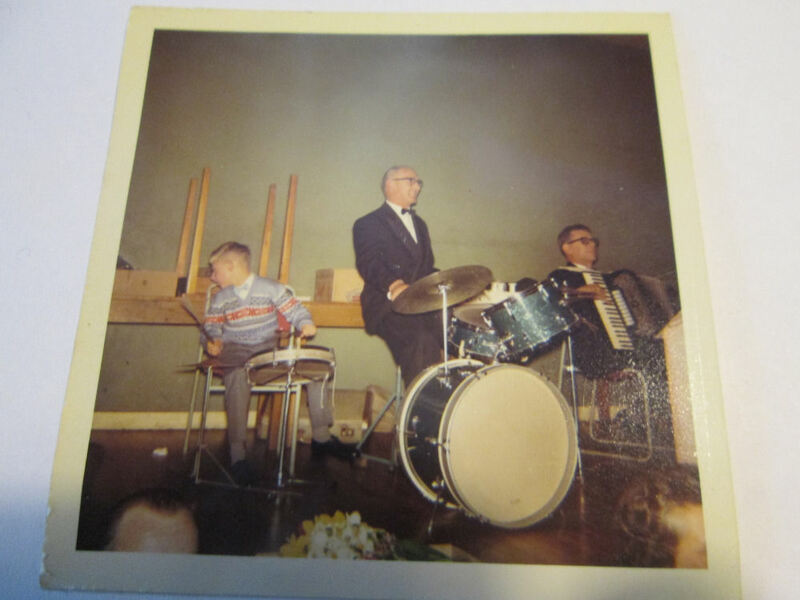 The youngster with his own drum kit on stage with my dad is blind, but my dad used to let him play on stage with them at this particular function every time it occurred. 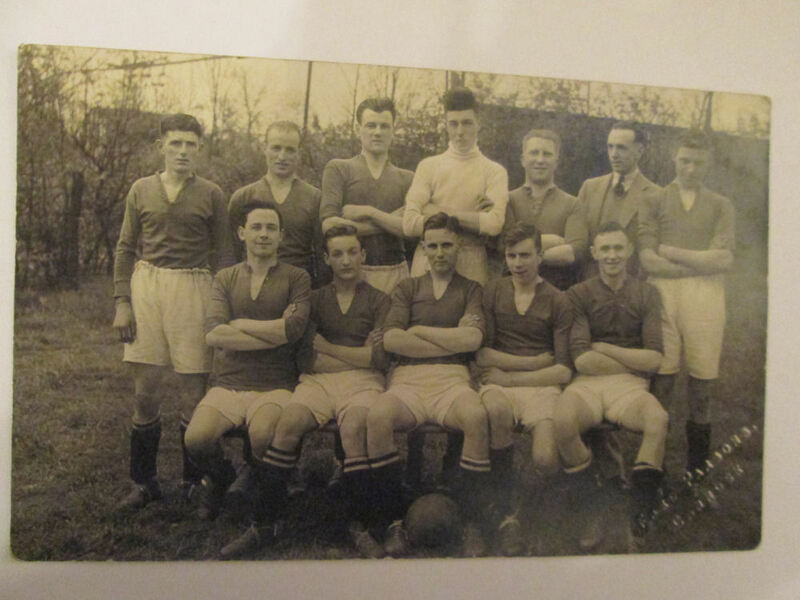 This is the first of a couple, of what I believe are later football teams of Eddies. 2nd in from left, back row, could be a Buttery. Centre back row with cap, could be Mr Spanswick. Far right, with long grey coat, is definitely Jack Melloy, Eddie’s brother in law. Middle row, 2nd from left, I think is Alf somebody, (who might have lived near to kent place or the bungalows), (local twang). 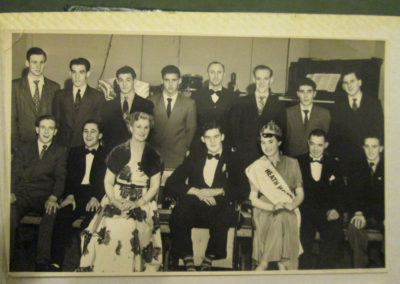 Front row, on left, I think is Michael Norwood, next to Norwood could be a Nicholls, & front row centre, is Brian Craddock. I have no idea, just what the man in the long black coat, is offering to the kneeling player. 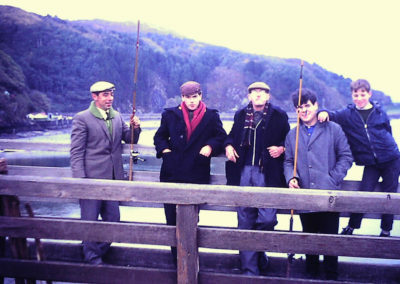 G. Nicholls, Tony Hill, A Nicholls (capt), Ray Hawkins, Graham Bevan, Francis Buttery, Eddie davis. 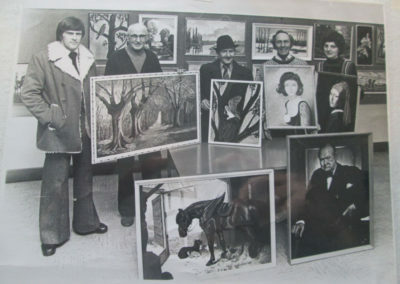 Front row left to right: David Suffolk, John Gough, John deans, Brian Craddock, Michael Norwood, & myself Melvyn Davis. I wish I’d got as many pounds, as times I’d marked the wimblebury road pitch out with sawdust, (obtained from Tony Humphries’s wood yard), on a saturday morning. 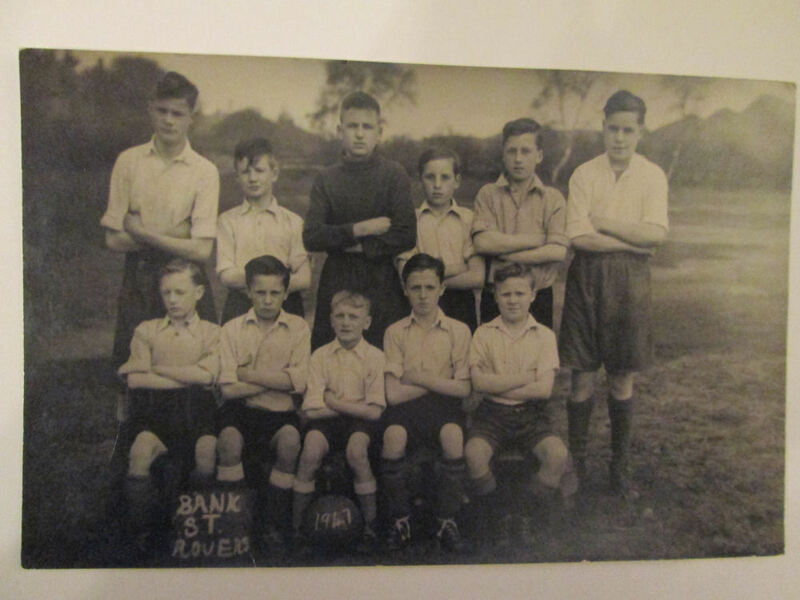 I know this was Eddie’s last but one youth club team, because a few years after this, I played in goal for a few games, but I don’t have any photo’s of the tea save & exit m I played in. I remember playing in goal very well, because I still have a lump on my right shoulder, whereby I went down to make a save on hednesford park pitch, & neither me or the opposing centre forward, drew away from the ball. It was at this time both Graham Bevan & John Gough, were approached for trials at aston villa through Eddie my dad. 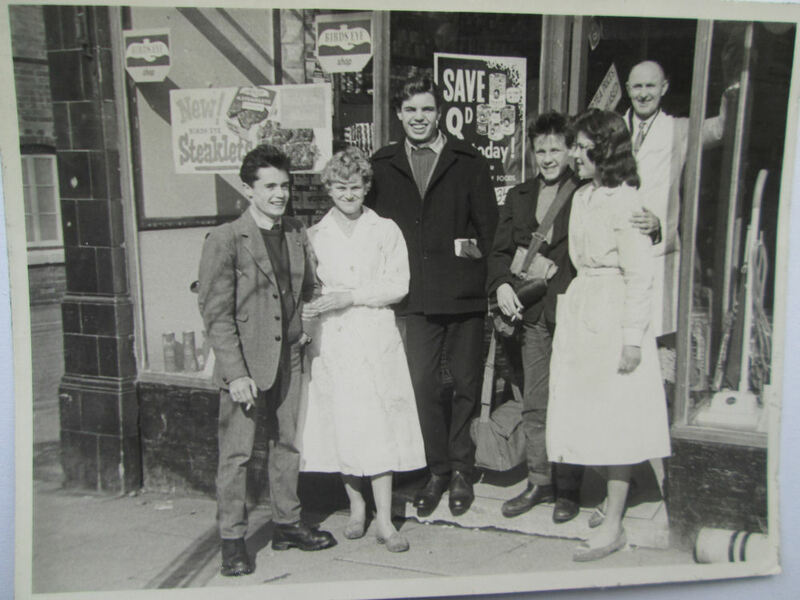 Two photo’s of eddie outside the very old coop, at the bottom of stafford street, with three members of the coop pathfinder youth club. 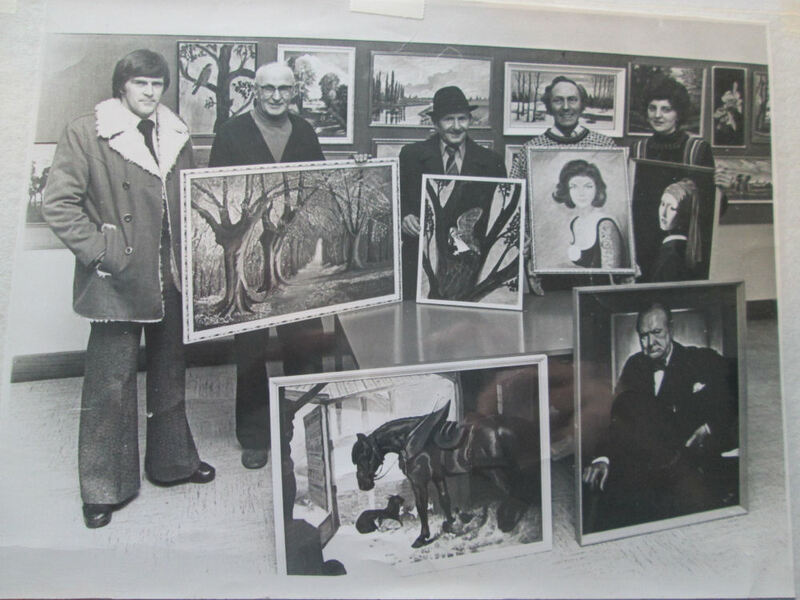 The top photo, shows, (from left to right), Brian Jones, (Joyclyn Metcalfe, coop staff), Bruce Grice, David Slater, (unknown coop staff, but might be a young Jill Winfield?) & Eddie. Bottom photo shows Eddie, making a note of the time that the three lads set off for keswick. This was on a saturday afternoon, & they were competing with a scottish youth club team, in a race to keswick, which was mid way between heath hayes & the scottish starting point – I have no idea who won, but both teams had to get to keswick in any way they could. 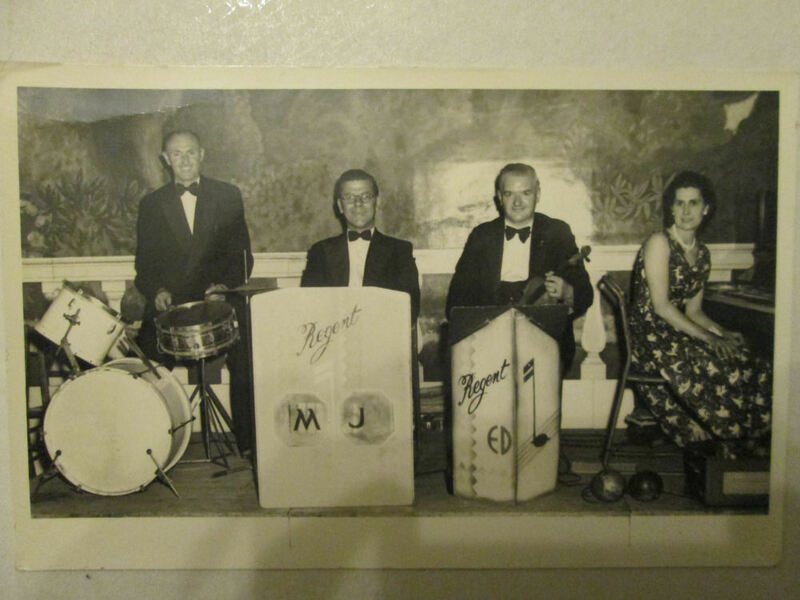 Eddie Davis, Percy Lomas, unknown, Janet Baggott, Jill Winfield, Winnie ? ?, & Joyclyn Metcalfe. Front row left to right: Margaret Jones, Betty Palmer, Betty Dennis, Pam Lees, Nan Swansborough, & Lois Lakin. Betty Palmer who sadly died, was reknown for knowing nearly every customers coop divi number, when working on the checkout. 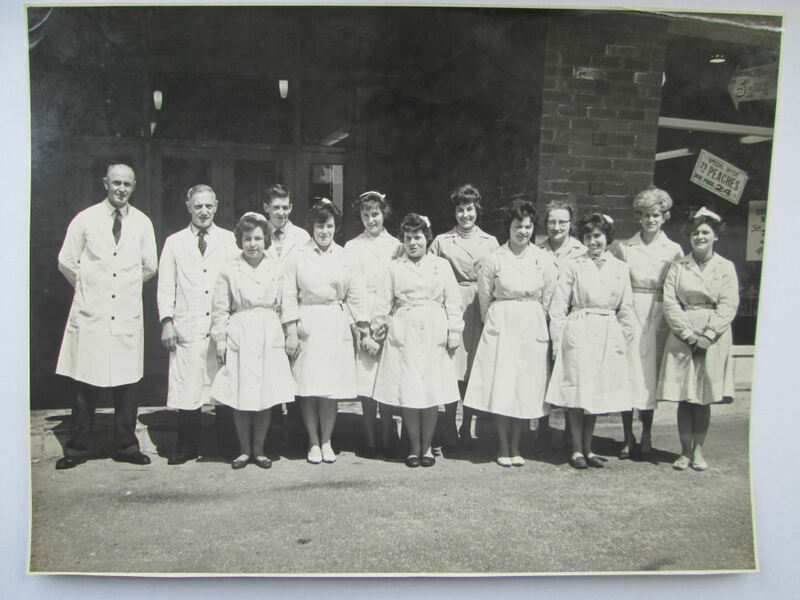 Another person I am going to mention, is edna emery, who is not on the photo, but who started work on the butchery section a while after. Edna’s light hearted banter & humour, I’m sure helped to make other staff, & customer’s day’s, a little brighter, whilst also still doing her job. If you go into the same shop today, privately owned, there are probably three or four people max. At any given time – how times change. My dad frequently got called out in the middle of the night, due to the shop alarm going off. I used to go to the shop with him, only to find, that most of the time, a moth had triggered the infra red security beam. However, we got awoke by the police this one night, went to the shop to open up, only to find a person had cut quite a small hole in the warehouse roof, at the rear of the shop, and stole some cigarettes from an internal caged store pen. The C.I.D. Turned up not long after we opened up, took one look at the very small hole made in the roof of the warehouse, and immediately said, “ oh it’s little johnny so & so, who’s broken in”. The hole in the roof was only about 10” square, I can even picture it now. The C.I.D. Guy said, ”this little Johnny so & so, is one of the smallest boned criminals in the area – what Johnny doesn’t realise is, that because it takes him no time at all, to cut a 10” square hole in a roof, it’s the size of the hole, that actually tells us who’s done the job”. I was lost for words, but they were right, because not long after, he was charged with breaking and entering. Again looking after the coop’s interest, and the young children of the village, eddie used to keep a tin of sweets on his office counter. Everytime parents came in with children, the child was given a sweet. One day Eddie’s boss noticed this tin of sweets, and said to eddie, “what’s this tin of sweets doing on your counter”. 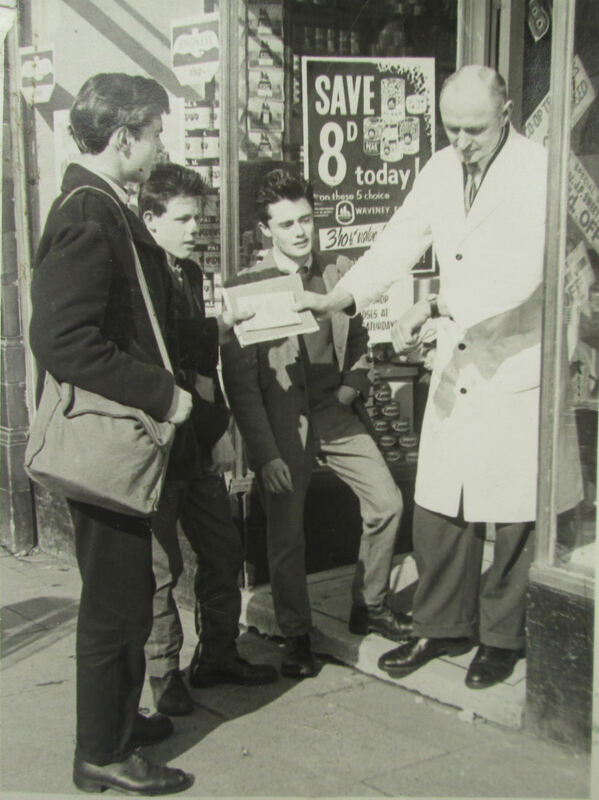 Eddie replied,”that tin of sweets, brings more custom into this shop than you will ever realise”. Eddie went on to say, “the number of mother’s that say, “I’ve had to come into the shop to buy something mr. Davis, because my child wants another sweetie, like she had last week”. Needless to say, the tin of sweets remained – I bet there are a few people out there, who remember having a free sweetie. 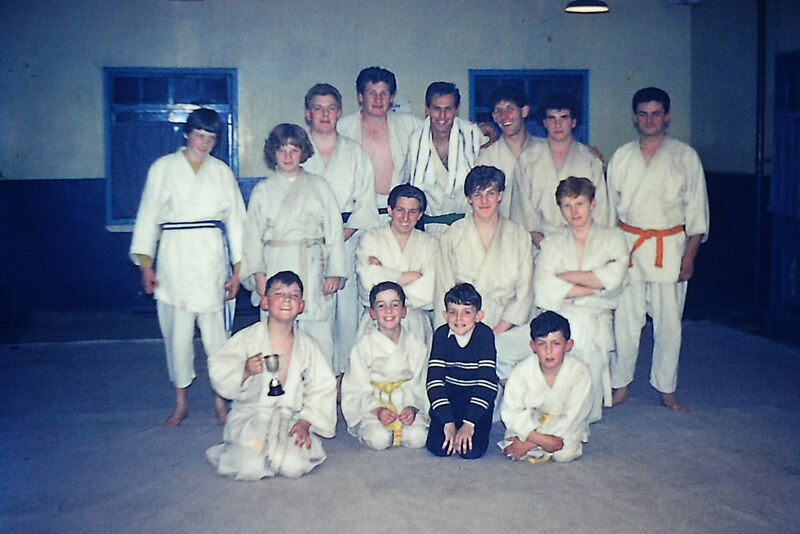 I believe I mentioned earlier that eddie also started a judo club, initially in st john’s church hall, but then transferred to wimblebury community centre. Above are two pictures, slightly blurry, due to transposing from 35mm film. The original black belt tutor was a gentleman by the name of Charlie Leinster I believe, who tutored with his then black belt partner Beryl. However, on moving down to wimblebury community centre, the tutoring was then taken over by a gentleman named doug, whose surname escapes me. Doug is the tallest man in the photo’s. I only remember a couple of names one being pauline dennis, (wavy hair left of centre), & the guy climbing on Doug’s shoulders (top photo) was called Geoff (I think). 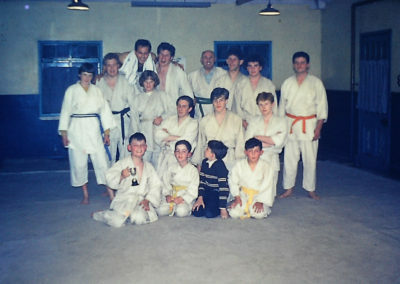 Eddie is also in the top photo, wearing my judo suit, with blue belt, as I took both the pictures. I believe the photo’s above were taken in 1964. As stated in my preface, Eddie relaxed by fishing. I actually started him fishing, because when he broke his leg in 1955, & was still convalescing, I went fishing to the pool down on the norton road, eddie came down with me, & the fishing bug got him, and stayed with him for years. 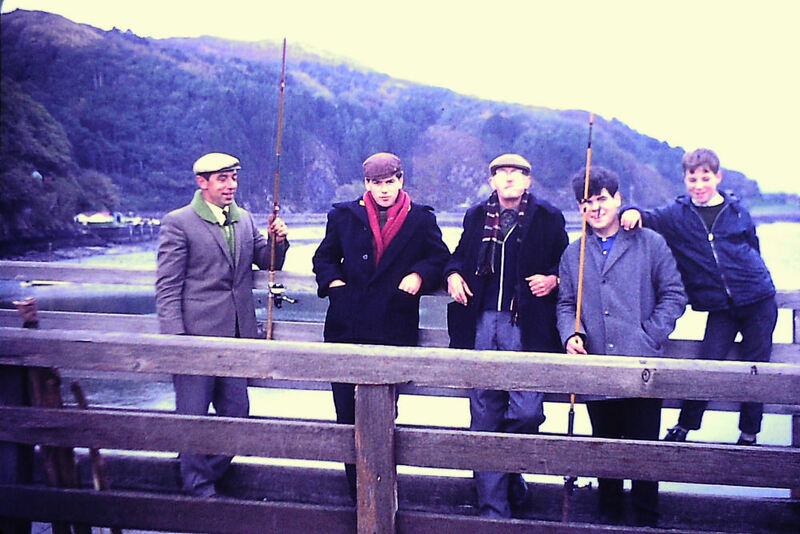 Above are photo’s of just three fishing days at barmouth, because t’was the only time Eddie was still. So to all the people who might have heard eddie’s fishing tales – the proof is above. Top: 1967 Eddie with my two mates Phil Haytree (heath hayes) & Martin Wright (triangle, chasetown). Also pictured is Ellis Roberts who was barmouth bridge toll collector. The fish are sea bass – delicious. 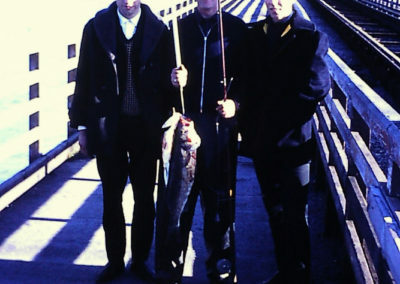 Middle: 1971 Eddie with yet bigger sea bass – my 7lb one & others not caught by me. 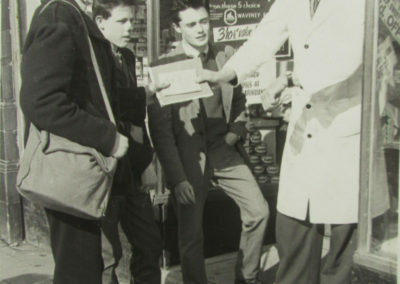 On Eddies right is Ivor Wilson, saxophonist/pianist with Eddies band in later years, and on Eddie’s left is Phil Haytree. Bottom: 1971 a different day. Eddie with friend Jim Colley, my mate Phil Haytree, & Jim’s Colley’s lads Phillip & Ivan colley. Phil haytree actually worked for Jim Colley all his life til retirement. 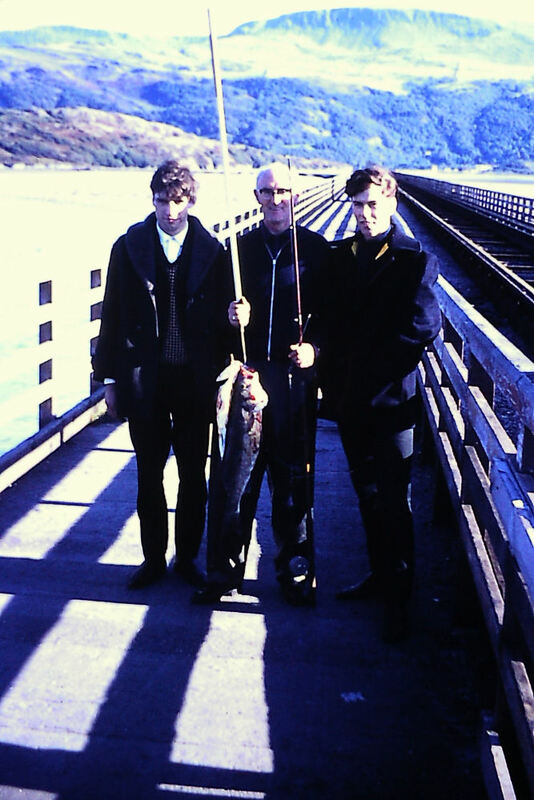 Phil Haytree actually hooked the biggest fish on our fishing days off barmouth bridge, but the fish unhooked itself just before it got up to the bridge. Again your’s truly took all of the pictures. After a long & successful career working for the coop, Eddie retired on 4th november 1978. The top picture is a picture taken on the day, with the staff working for him at the time. 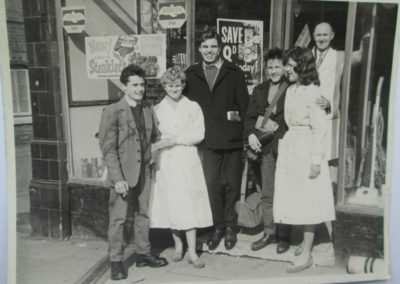 I don’t believe there is a member of staff on the above photo, (except eddie) who was on the original photo when the shop opened. 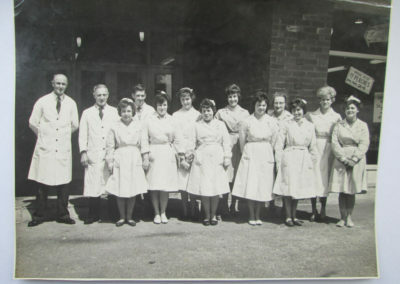 However, the staff pictured above, are from left to right: Kath Homer, Mandy Cadman, Sue Westwood, Eddie, Barbara Cox (rear), Minnie Thacker (front), Marjorie Cooper & lloris Lunt. As stated in the preface, after retirement Eddie went to work part time at Tyler mall in wimblebury, and when Tyler mall finished, personnel from tyler mall, along with others, started up Brian James furnishings in Cannock. 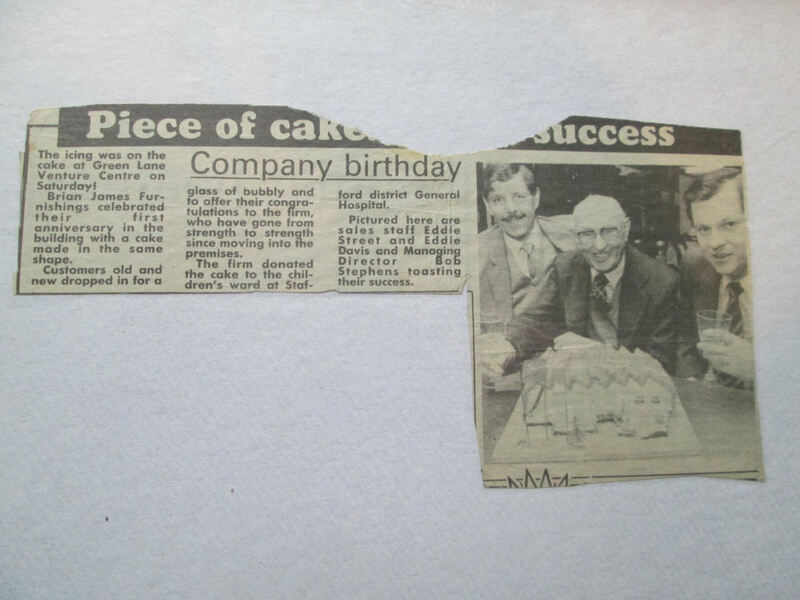 In the bottom picture, Eddie is pictured on the first anniversary of the opening of Brian James in cannock. 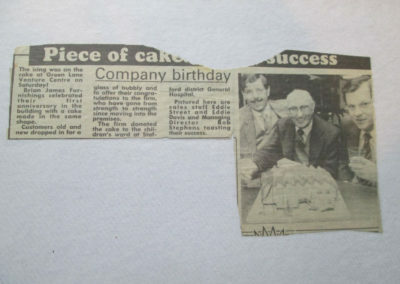 The gentleman with the moustache is Eddie Street, and the other gentleman is Bob Stephens managing director at the time. A few years prior to retirement, Eddie started painting as a form of relaxation, instead of fishing. 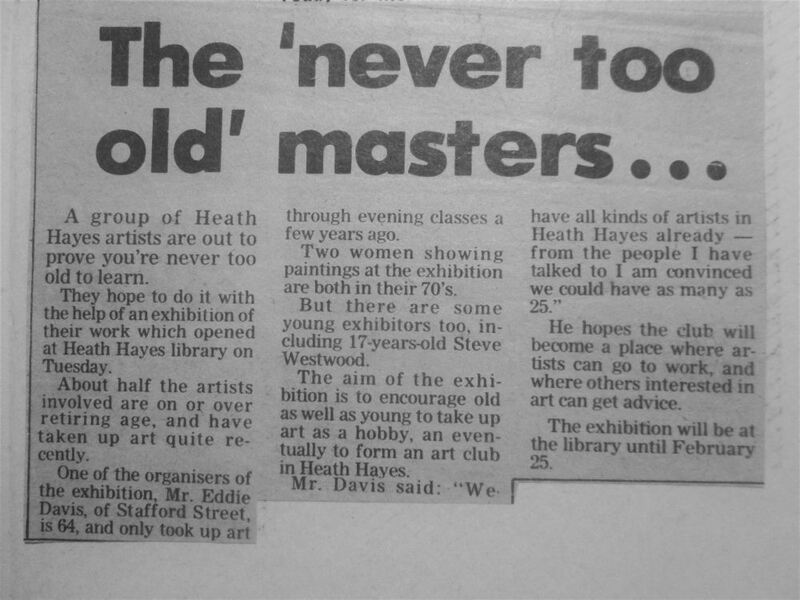 He became one of the instigators of the Heath Hayes arts society, which I believe is still going today. 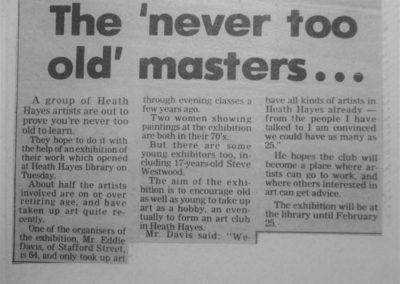 They started the classes at the Heath Hayes library, and regularly held exhibitions of members paintings in the library. The above photo & the words below it, were in the local paper. 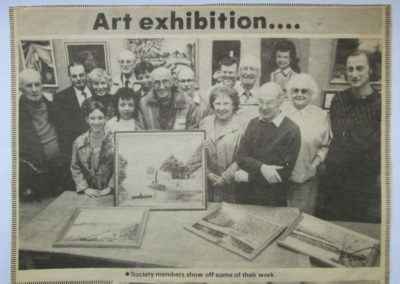 I believe this to be a later photo, after the arts society became more established. 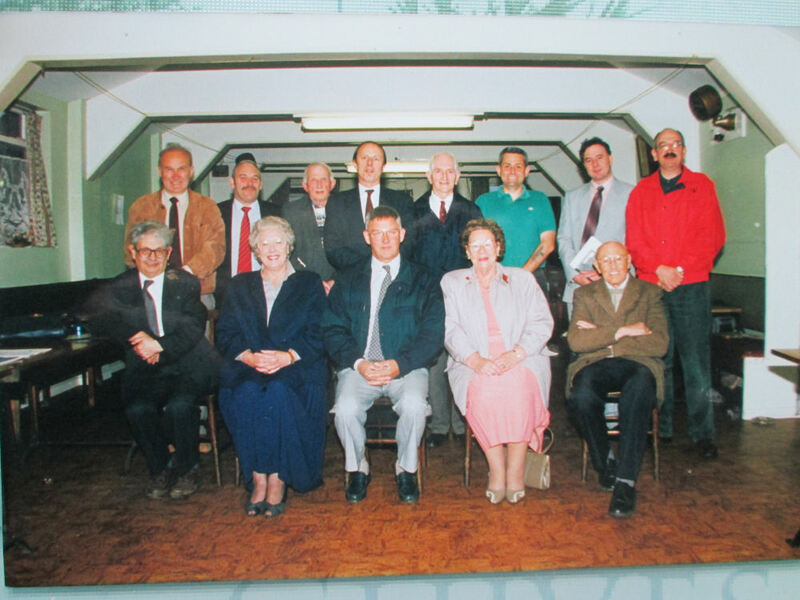 Apart from Eddie, I can only name two other people on the photo, those being Tony Broadbent on the extreme right, a nice guy whom I was at school with, & the gentleman on the right forefront with his arms folded is Des Bill, who worked for Blagg’s Builders merchants in hednesford. I believe both of these people had valued imput into the society. These photos are taken from a local newspaper cutting. After Eddie’s venture of starting the arts society, when he was in his mid to late 70’s, he felt he wanted to do something else. So with no more ado, he became an active member of the local heath hayes & wimblebury parish council. I remember one night he came back from a parish council meeting, & this would have to have been in the mid 1990’s, whereby, a plan had been passed for the Dugdale and Wimblebury housing scheme to go ahead. Eddie was astounded that with all these houses going to be built, no school had been included in the scheme. The school never got built, but not too long ago, in the local free paper, a body of people, I think from Wimblebury were now advocating they thought a school was necessary for their area. Foresight that is ignored is more culpable than any hindsight. Unfortuantely, I can only bring to mind four people’s names on the photo, namely, Les Bullock (far right rear row), Bob Merry (far left front row), Mick Doody (centre front row), & Eddie (far right front row).